A chemical plant fire burns near Crosby, Texas, northeast of Houston, April 2, 2019. A tank holding a flammable chemical caught fire at a Texas plant Tuesday, killing one worker, critically injuring two others and sending panicked employees fleeing over a fence to safety. 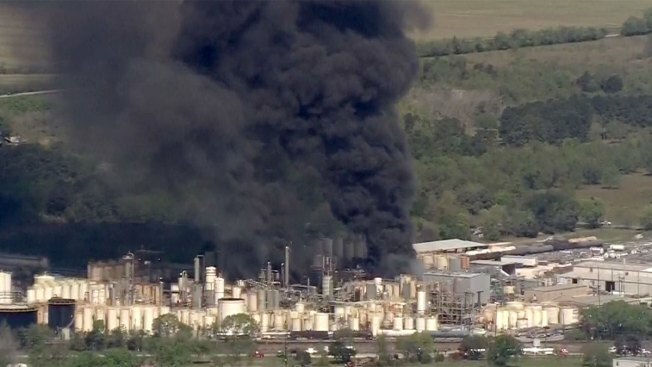 Authorities shut down a roadway near Tuesday's fire at a KMCO chemical plant in Crosby, about 25 miles (40 kilometers) northeast of Houston, Gonzalez said. Fire crews battled the blaze for about 5 1/2 hours before they extinguished it, according to the fire marshal's office. The fire erupted about two weeks after a March 17 blaze at a petrochemical storage facility in Deer Park , located about 20 miles (32 kilometers) south of Crosby. That fire at a facility owned by Intercontinental Terminals Company burned for days and triggered air quality warnings. Crosby also is where an Arkema chemical plant was inundated by water during Hurricane Harvey in 2017. Some chemicals eventually caught fire and partially exploded. Gonzalez said a transfer line at the KMCO plant ignited in the area of a tank of isobutylene -- a flammable colorless gas used in the production of high octane gasoline -- which then caught on fire. "We didn't think anything of it -- we didn't think it was anything severe," he said. Pilar Davis, a product manager with KMCO, said none of the emergency evacuation points at the plant were blocked during the fire. At a news conference late Tuesday afternoon, John C. Foley, chief executive of KMCO, said a cause of the blaze is still being determined. "We will conduct a thorough investigation ... and take steps to ensure this doesn't happen again," Foley said. Davis said the fire initially ignited with isobutylene but was fueled by ethanol and ethyl acrylate. All three are chemicals and solvents used to make fuel additives at the plant. Davis declined to comment on the worker who was killed and the two who were injured, only saying they were part of KMCO's operations department. KMCO, which was founded in 1975, is a chemical company that offers coolant and brake fluid products and chemicals for the oilfield industry. The Crosby, Sheldon and Channelview school districts asked students and staff to shelter in place at all their campuses. But later Tuesday afternoon, all three districts lifted those orders to shelter in place. Foley said his company's number one priority "is safety and compliance." "We have a long track record of investing in the, people, the systems and the assets to operate safely," he said.